I joined Team Be The Match to raise money because I’m passionate about saving lives! 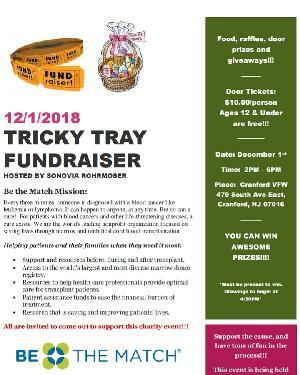 I will be hosting a Tricky Tray Fundraiser, which will include raffles and door prizes, and will ultimately spread awareness within the community. For anyone who is unable to attend, I kindly ask for a monetary gift donation benefiting Be The Match. Your gift can add new potential marrow donors to the registry, assist patients with uninsured transplant costs and fund innovative research to improve transplant outcomes. A marrow transplant can be a life-saving treatment for more than 70 diseases including leukemia, lymphoma and sickle cell. Seventy percent of patients do not have a matching donor in their family. They depend on Be The Match to find an unrelated marrow donor and receive the transplant they need. Please help me reach my fundraising goal by making a tax-deductible contribution. Your gift delivers cures to patients desperate for a second chance at life. Every dollar counts. Together, we can make a difference! Unlock this badge: I’m $3700 away from this badge. Give now! Unlock this badge: I’m $8700 away from this badge. Give now!